Enjoy seasonal food this summer – bake a traditional summer pudding using the finest produce in your region. The summer months are rich in produce, with berries and fruit being a natural highlight. Indulge your sweet tooth with our recipes for cherries and gooseberries. Summer fruit is a real highlight of the British food season. If you grow your own, put in some fruit bushes. They are low-maintenance and high-reward, provided you keep them netted against the birds – who are also partial to our seasonal fruit! Gooseberries, blueberries and blackcurrants are all fairly compact bushes that can be fitted into a small garden. Cherries come into season in mid June, and stay in fruit until July. Buy plenty while they’re cheap – these wonderful berries are bliss straight from the bag, but also make a beautiful jam. Try baking them in a traditional French Clafoutis – see our recipes below. Gooseberries come into season at the end of May (if you have an early variety) and continue through the summer months. They’re a contrast to the sweet red strawberries and blueberries and, while some modern varieties are suitable for eating uncooked, most gooseberries demand to be cooked. This makes them perfect for traditional summer puddings like Pavlova and crumble – see below. Elderflowers are also in season at the beginning of summer. They are here and gone in a flash, so look out for elder bushes and remember to call back frequently. Pick considerately, remembering to leave some flower heads to ripen into berries – bird food. It’s easy to make traditional syrup by simmering the flower heads with lemon juice and water, straining, and adding sugar – recipes are available online. Put the pitted cherries into a 23cm baking dish with deep sides. Sift the flour and salt into a large bowl, and add the sugar. Make a well in the middle and add the beaten eggs, brandy and milk, stirring the sides until everything is incorporated. Switch to a whisk and beat well until bubbles start to form. Pour the batter over the cherries. Bake at 180 degrees C for 30 minutes, or until golden. 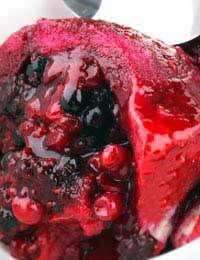 Serve with vanilla ice-cream and cherries marinated in kirsch, if liked. Crumble is a traditional British pudding – and on a rainy day in summer, it’s the perfect end to your meal. Simmer the gooseberries in a small saucepan with the elderflower syrup until they are soft. Put the fruit into two ramekins and preheat the oven to 180 degrees C. Rub the butter, sugar and flour together until you have a sandy crumble. Divide it between the two ramekins and sprinkle with flaked almonds. Bake for 15-20 minutes or until golden on top. Serve topped with a spoonful of clotted cream!